Today marks four years since a newly elected President Barack Obama spoke to a packed, enthusiastic audience of students at Cairo University, calling for “a new beginning between the United States and Muslims around the world.” The June 4, 2009 speech was the new administration’s most high-profile effort to revive the image of the United States in Egypt and other predominantly Muslim nations, following the rise of anti-Americanism during the George W. Bush era. Four years later, much has changed in Egypt, but anti-Americanism persists. Roughly eight-in-ten Egyptians (81%) expressed an unfavorable opinion of the U.S. in a poll conducted this March by the Pew Research Center. 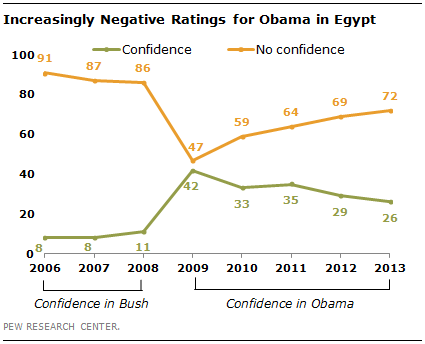 Today, the U.S. gets even more negative ratings in Egypt than it did throughout much of the Bush presidency. Over the last few years, polls have found a familiar list of Egyptian concerns about the United States. American anti-terrorism efforts are unpopular among Egyptians. Most think the U.S. ignores the interests of other countries. And few believe Obama has been fair in dealing with the Israelis and Palestinians. Even American aid is viewed with suspicion – majorities say U.S. military and economic assistance is having a negative impact on Egypt. At the start of his presidency, Obama received significantly more positive ratings than his predecessor. In 2009, Egyptians were almost evenly divided between those who expressed confidence that Obama would “do the right thing” in world affairs (42%) and those who lacked confidence in the new American president (47%). But Obama’s ratings have steadily declined, and today, only 26% of Egyptians express confidence in him, while 72% have little or no confidence. In what may seem a paradox to some, the negative ratings for Obama, and for the U.S. overall, have continued and even worsened during a period in which Egyptians have actively embraced a number of freedoms and institutions central to American-style democracy. Egyptians may be dissatisfied with the way their new democracy is working, but most continue to want free speech, a free press, and competitive multi-party elections. However, the toppling of a dictator and the advent of democracy in Egypt has not boosted America’s image there. And looking ahead, few see improving relations with the U.S. as a priority. About seven-in-ten (69%) say it is not important for Egypt to have a good relationship with the U.S.
“No single speech,” Obama noted in his Cairo address, “can eradicate years of mistrust.” The ensuing four years would show just how deep that mistrust runs, and just how steep a climb the U.S. faces in turning around its image in Egypt and many other parts of the Muslim world.